Read about my adventure in building replica droids from the Star Wars Saga. Well as luck would have it, I am able to attend all four days of this years Droid-Con after all. Cya there. Yeah. So Lucasfilm recently announced "Celebration Orlando" in April of 2017. Yes, of course I'm going. 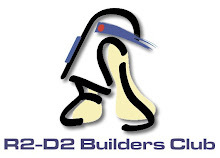 R2 Builders Club is all ready buzzing about it and making plans. Maybe I can win the Droid Races this time. Yeah. Long time since last post. I've had a lot on my plate lately so my Droid building hobby has had to take a back seat for a awhile. Main issue has been a little water leak in my workshop space in the basement when it rains. I've had to completely dissemble my workshop so I could fix it. I think I have it temporarily fixed so all that's left to to everything back together again. Second issue is after assembling the new legs I found flaws in the measurements. So back to square one with that. Will have to make a new template again and get a new miter saw. Current one is decades old, slightly out of alignment and can't be realigned. Once I get the shop put back together again I can start on Legs version 3. Droid-Con IV is this June, but unlike last time I'll only be attending one day. Need the vacation days for something else. One new project idea I recently thought of is making the head of the droid HK-47, the assassin droid from the RPG video game Knights of the Old Republic by Bioware. Haven't figured out how I'll make it yet. When complete I want him to have glowing eyes, servo-controlled head tilting and voice track playback. He'll be automated so when you get near him he'll start twiching his head and say a phase from the game. I don't think anyone else has done this before...that I can thus far find anyway. [Closing Statement] "Will try to give another update soon....meatbags." Saw the new "Official" full Trailer for Star Wars: The Force Awakens. YEEEEHAAAAAAAAAAAAAAAAAAAAA!!!!!!!!!!!!!!!!! I'm excited. Just bought a ticket for the early showing and for the next day at my local 3D IMAX. Nothing new about R6. Various things had to be prioritized time and money wise. Will resume when able. Droid-Con has just been announced for June 16th-19th, 2016. The con will be held at a different Hotel this time because Droid-Con has gotten too big (head count wise) to fit at the previous place. The new Hotel is actually brand new and across the street the other one. Of course I'm going. Already signed up. I'm thankful they do this in Indiana every time. Once I'm done getting the legs usable I'm going to focus on finishing the head. I have a full year to do it so wish me luck. As always go to www.astromech.net or www.droidcon.info for more information. Started first two pieces of right leg and added another piece onto the left leg. Started work on a detail piece for the legs that I never got around to making for the first set. But I'm going to need buy the band saw attachment for my Mark V before I can make any head way on this piece. Glue the next piece on. Wait another 24 hours. Repeat.